Best hostel I’ve ever stayed at. The staff are so welcoming and instantly made me feel at home -“you are in your house” as one of them put it. Amazing amenities, like a proper coffee machine, everything you could need in the kitchen, really cosy communal spaces, light and airy dorms and amazing bathrooms! Everything was immaculate, no weird odours here. Met some great people and would have stayed longer if I could have. Great location too. I miss my house already! This may be the nicest hostel I have ever stayed in, ever!! If there is availability, just stay here!! Excellent staff, facilities, location, wifi... everything was perfect! A beautiful, clean space, and a lovely, helpful staff. I really enjoyed my time here and would definitely recommend to anyone going to Puerto Varas. Amazing hostel! Everything was perfect : the building is beautiful, the room was huge, the bed was comfortable, the bathrooms were beautiful and clean, and the staff was so nice and helpful. I recommend it 100%! Great place to stay. Loved the vibe and the fact an old hot is being loved and valued by many. Great hostel with great location close to centre and supermarket. Fab atmosphere, comfy beds and really great helpful staff. Enjoyed my time so much I booked an extra night. Its got as much tea and coffee as you can drink :) I will be back ! This was our second time here and was just as amazing the second time around. Love sitting in front of the fire. One of the best places we’ve stayed in 15 months of travel. And great value. 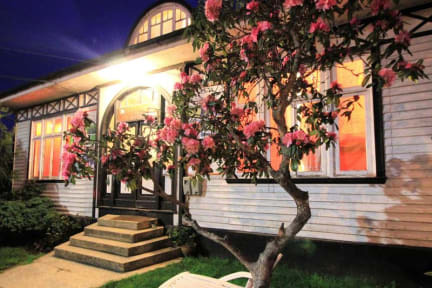 If this hostel is available, stay here when in Puerto Varas. Great hostel. Beautiful building. Staff were amazing and friendly. Great kitchen with free coffee from a proper machine. It was an engaging hostel. The only thing I would say is my mattress was not great. Big dip in the middle so it was kind of a battle to sleep on. That, and because it's an all wood building, you can here every little thing and I'm a very light sleeper so it was not good for me for sleeping. But if your not so sensitive, you will be fine. I'd still stay again. Gracias!